Nvidia just announced plans for "Pegasus," its next-generation system for autonomous cars. Due out in the second half of next year, Pegasus is a license-plate sized computer that the chip giant says can process 320 trillion operations per second. That, Nvidia said, is the equivalent to a 100-server data center and — more importantly — enough to power a fully autonomous car. Why it matters: Increasing raw compute power is just one of the hurdles to getting to fully self-driving cars into mass production. That said, such a boost in processing allows the cars to make more use within the vehicle, including real-time analysis and inference based on data from radar, lidar and optical sensors. Current picture: Although companies are already testing fully autonomous vehicles, most are very rough prototypes. On the compute side, most of the cars today have multiple PCs or servers in the trunk consuming thousands of watts of power. "This is the path to production," says Danny Shapiro, senior director for automotive at Nvidia. The competition: Intel and Qualcomm are also pursuing a role in the autonomous car industry with each company having an area of strength, according to analyst Patrick Moorhead, president of Moor Insights and Strategy. 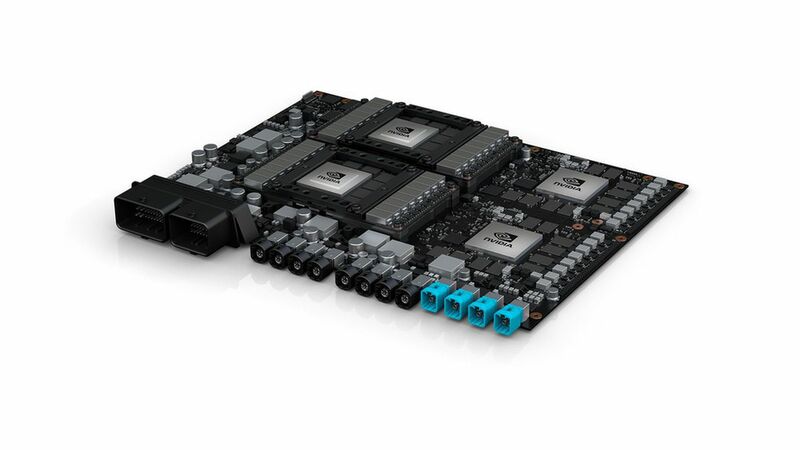 Nvidia has the early lead on the processing and machine learning side. Intel recently acquired MobileEye, which is a leader in advanced driver assistance systems. Qualcomm is doing well when it comes to modems and infotainment systems. Yes, but: Nvidia's move is a big one, Moorhead says. "It has been possible to have the required compute level in a datacenter and even filling the back of the car, but it sucked way too much power and was too large and took too much cooling to be an effective auto solution," he says.